New York Times reports Trump and his advisers are developing new framework for Israel-PA peace. U.S. President Donald Trump and his advisers have begun developing their own concrete blueprint to end the conflict between Israelis and Palestinian Arabs, The New York Times reported Saturday. After 10 months of educating themselves on the complexities of the world’s most intractable dispute, White House officials said, Trump’s team has moved into a new phase of its venture in hopes of transforming what it has learned into tangible steps to end a stalemate that has frustrated even presidents with more experience in the region. According to The New York Times, Trump’s team has collected “non-papers” exploring various issues related to the Israeli-Palestinian conflict, and officials said they expected to address such perennial dividing points as the status of Jerusalem and the communities in Judea and Samaria. Analysts said they anticipated that the plan will be built around the so-called “two-state solution” despite the fact that Trump has been non-committal to a Palestinian state. 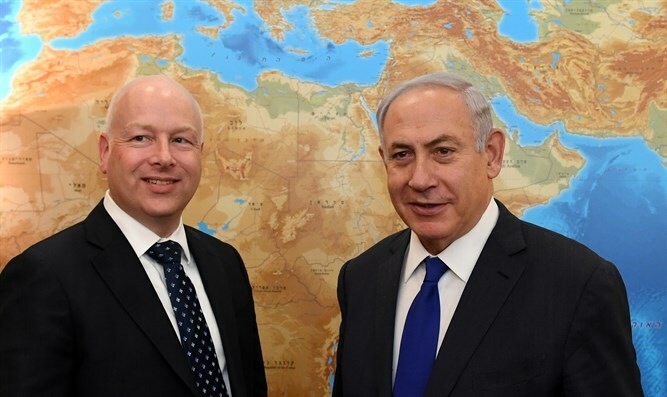 “We have spent a lot of time listening to and engaging with the Israelis, Palestinians and key regional leaders over the past few months to help reach an enduring peace deal,” said Jason Greenblatt, the president’s chief negotiator, who has made several visits to the region in recent months. “We are not going to put an artificial timeline on the development or presentation of any specific ideas and will also never impose a deal. Our goal is to facilitate, not dictate, a lasting peace agreement to improve the lives of Israelis and Palestinians and security across the region,” he added. According to the report, Trump’s team sees the convergence of factors that make the moment for peace ripe, including an increased willingness by Arab states to finally solve the issue to refocus attention on Iran, which they consider the bigger threat. With that in mind, Egypt is brokering a reconciliation between Palestinian Authority (PA) chairman Mahmoud Abbas and Hamas, a deal that would cement the PA as the representative of the Palestinian people. Saudi Arabia has summoned Abbas to Riyadh to reinforce the importance of a deal. The four-member team drafting the plan includes Jared Kushner, Trump's son-in-law and senior adviser, Greenblatt, Dina H. Powell, a deputy national security adviser, and David Friedman, the U.S. Ambassador to Israel. They are consulting with Donald Blome, the consul general in Jerusalem, and others from the State Department and National Security Council. Officials said the effort may take until early next year. The team has drawn praise from across the spectrum, noted The New York Times. Some analysts quoted by the Times said they believed Trump’s plan may come with confidence-building provisions that each side will already have agreed to. For Israel, it could include limiting construction to current blocs without taking new land, recommitting to a two-state solution and redesignating a small part of Judea and Samaria to give Palestinians more control. For the PA, the analysts said the plan could include resuming full security cooperation with Israel, holding off seeking further international recognition and ending payments to families of imprisoned terrorists. Arab states, particularly Saudi Arabia, Egypt, the United Arab Emirates and Jordan, could add their own commitments, like overflights by Israeli passenger planes, visas for business people and telecommunications links. A White House official dismissed that as mere speculation. Israel has agreed to resume peace talks, but Abbas continues to impose preconditions on talks instead of meeting Netanyahu. PA officials have expressed pessimism over Trump's peace efforts.